Medium / techniques: Lost mould method where a chosen book and any attachments is invested in a crystalline silica mould which is then placed in a kiln where the original book is burnt away. The resulting void is filled with a suitable molten metal. In this case aluminium. The glass vessels are silver gilded. 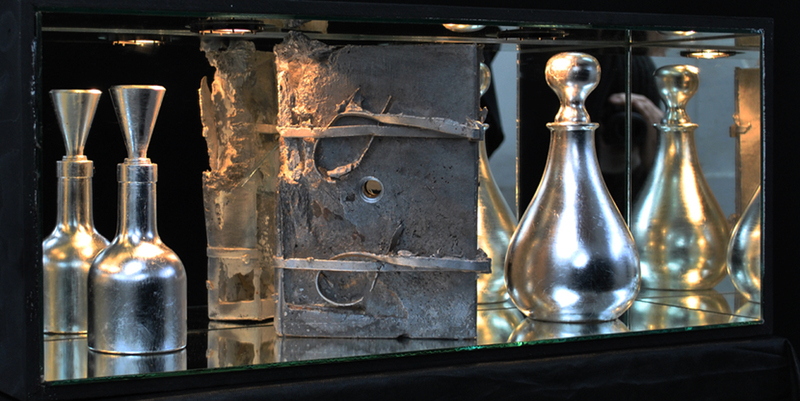 The resulting 'still life' is set in a mirrored case. 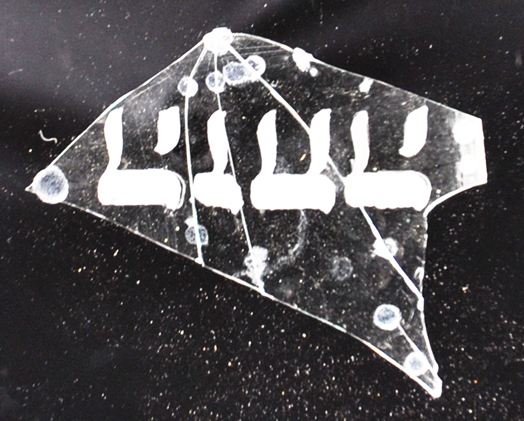 Hidden behind the book on shards of broken glass is the Hebrew title inverted. For me this image is reminiscent of flames. Medium/techniques: A selection of found books destined for pulping were bound by strands of barbed wire and subjected to temperatures in excess of 1000 degrees Fahrenheit. When the desired results were achieved the burnt books were treated with a silicone stabiliser. Medium / techniques: Lost mould method where a chosen book and any attachments is invested in a crystalline silica mould which is then placed in a kiln where the original book is burnt away. The resulting void is filled with a suitable molten metal. In this case cast iron, which was then gilded. The glass bottle contains mercury which picks up local vibrations, including those emanating from the vibrating amplifier (see mp3 file) below the ceiling vent to the right of the book, which together form the image of a 'lamp'. Medium / techniques: Dictionary: Lost mould method where a chosen book is invested in a crystalline silica mould which is then placed in a kiln where the original book is burnt away. The resulting void is filled with a suitable molten metal. In this case bronze. The false ledger is an adapted ex-book. The refractory gloves conceal a miniature amplifier recording Klezmer music. The attached mp3 file is an example only, as a piece is being especially written for this work. As is often the case, a simple task resolved this problem - for the time being. In the course of research for what turned out to be the first completed work, I discovered the Hebrew word for writings, which when inverted appeared to me as flames. I then learnt that in essence ‘Holocaust’ means ‘Burnt Sacrificial Offering’. From then on everything fell into place, resulting in four works from which ‘K’tuvim’ was chosen for this exhibition.